I've been seeing a few cosmographia in the manuscripts. A cosmograph is a picture of the whole world, showing the sublunar part, our world of chance, decay, and death, and usually also showing the eternal part, the perfect part, starting with the realm of planets, which move in perfect crystal spheres. Then comes the firmament: the starry sky with constellations, which are shown on the parchment by drawing the Zodiac. Beyond the firmament, is the realm of God, which is eternal, with perfect justice. From the planets on up, the cosmos is not even made of the four elements that make up our world below: it is made of a fifth element. The moon is the lowest planet; and from the moon on up, all is perfect and eternal, while our world beneath the moon is a world of imperfection: of change, capricious chance, decay, and death. Our sublunar world can be drawn on parchment in many ways, all of them round: 1) as a map, 2) as a sphere with Hell in the center, or 3) as the four elements, often shown as scenes. Or the world's nature as a world of decay and death, can be shown by 4) the seven ages of man (which is also shown as a wheel). You also sometimes see 5) one man, the microcosm, in the center of the macrocosm. The way that chance rules our world can be shown by 6) the four winds, or 7) Fortuna's wheel. Change can be shown by 8) The cycle of the year as four seasons, or less commonly, 9) as the twelve months. Change can also be shown as 10) the phases of the moon. The moon is visibly blemished, and is a very symbol of constant change; as the lowest planet, it is in part subject to the rules of our sublunar, changeable, imperfect, world. There are of course many similarities between cosmographia and the tarot, and especially the Minchiate, which adds two standard cosmographia components: the zodiac and the four elements. You could say the Minchiate used the chance provided by having twenty more spaces to fill, to add in just the concepts a cosmographia should have. The Cary sheet artist, with no new spaces to fill, managed to include three Zodiac figures by making Sun, Moon, and Star do double duty, as if there was a felt need for Zodiac constellations in this card game. I like to think of cards as being laid out, rather than listed; laid out in rows of related cards. I've been thinking for some time that since most of the poems we have start at the highest rather than the lowest trump, there really is no reason at all for trumps to go down the page starting from the weakest. Starting with the strongest instead would put the highest numbered trumps (the strongest for taking tricks) highest on the page. This would also reflect the order of the poems. So I laid out the Minchiate. I put the highest rows at the top, but I absent-mindedly forgot to reverse the cards within each row. I went back and corrected that mistake, but when I started to reverse the row with the twelve zodiac signs, I realized I would be making the year run backwards (I have a bit to say about the non-standard Minchiate Zodiac order in another post). Here is the layout, from Angel at the top to Bagato at the bottom, each row running highest to lowest except the Zodiac row. The deck is an early Minchiate; the backs show a picture of Andromeda, although the label on them is "Etruria." I think these are the same card maker as the "Colomba" decks I was looking at in my "detective story" post. The Minchiate layout as a cosmograph. This layout has some resemblance to a cosmograph (cosmographium? ), not just in what things are there but in where they are. Godly things are up at the top where they should be, above the stars. Albrecht von Eyb's, Versbearbeitung einzelner Prosastellen ..., [title goes on and on], 1400-1499, München BSB Cgm 5185, image 59. The Zodiac signs are not drawn, but the sign names are in the white band just outside the black starred circle, as can be seen in this detail below. We see the words Celum Empirean, (Empyrean Sky), and the white circle is labeled elsewhere, Celum Crystallium (Crystal Sky). Christ and, I think, Mary, sit at the top. In the outermost band the human figures may be saints: I can make out "Apostoli" and in a triple crown, "Pontife??" and well below him "Confessor." The angels are Seraphim, Cherubim, Thrones, Dominions, etc. So the Minchiate, as laid out with the highest trumps highest, is somewhat like a cosmograph, in that the Zodiac is a band between the godly things at the highest place, and things below which depict our mundane world. The colored circles are the orbits of the seven planets, The Moon, Mercury, Venus, The Sun, Mars, Jupiter, and Saturn. The outer sphere of Divine Justice should be part of any cosmograph, as here: Christ in Judgment is at the top of the outermost sphere. A cosmograph should also show how capricious Fortune rules our sublunar world. This is not always shown on the same image, but often on a nearby one. This is not by accident. The goods which Fortune can lend, which you might lust for, are never given but only lent; she takes them back: she is as inconstant as the moon. Your lusts make you like an animal: the passengers on her wheel are often shown as animals. The animal which you will be, if you lust after Fortuna's baubles, does not gain true happiness from that giddy and insecure possession. The meaning of a cosmograph is the contrast of the outer sphere of perfect justice, which is shown by a circle, compared with the central circle of the sublunar world, the realm governed by chance. Both parts are needed, but they don't have to be painted on the same sheep. I expected to find some picture of chance and decay, not too far away from this cosmograph, so I went looking for it: there's a wheel of Fortune in the same book, five pages away. Here is the Earth from the above cosmograph, showing the mouth of Hell with a devil (Hell was at the center of the Earth, and so was the actual center of the Medieval universe). This scene shows earth, and water. The air is helpfully labeled "aer." Fire in this case is the fires of Hell. The four of them are, of course, in a circle, representing the capricious winds. So that's a cosmograph. Under the sky represented by the Zodiac row, should come our sub-lunar world of capricious chance, decay, and death (all of which the Minchiate has). Earth can be represented by a scene, as here, or symbolically in various was, such as by the four elements. The four elements in the Minchiate are just where they should be, under the Zodiac. Cosmographia do not show the seven virtues, which the Minchiate has, and cosmographia do show all seven planets, which the Minchiate does not. There are a great many one to one alignments in these diagrams, such as the four elements aligning with the four humors, the four directions, the four winds, etc. I've seen the seven planets aligned with the seven notes of the octave. But so far, I haven't seen the seven planets in a one to one alignment with seven virtues, but that may exist. Our second cosmograph, and second Wheel of Fortune: Here is another cosmograph. Note the two red wheels. The outer wheel also has upright figures going up, and head downward figures going down, but it is not another wheel of Fortune. The rising figures are labeled "Vadi Paradiso" and the ones going down are labeled "Set Ecia Maledictionis." (detail rotated 90 degrees). They are on their way down to "Inferno" where there are "Demoni." So the outer wheel is a Last Judgment; Christ in judgment sits at the top of the outer wheel, above the insecure throned king on the wheel of Fortune. As usual in a cosmograph, our world of chance and decay is in the middle, this time symbolically represented by the wheel of Fortune. Above the whole rectangle is Heaven, a series of domes, with St. Peter (huge key) at the door. They are above the blue sky. Christ is flanked by the sun and moon (possibly shown as dark). So the sun and moon cards in the Minchiate layout are where they should be, as well. Cosmographs are from Boethius, as are Fortuna's Wheels. In a cosmograph, our world of chance, death, and decay is in the center, and the spheres of the perfect and eternal are all around it. Of the two cosmographs we've considered so far, both had judging Christ. One showed our mundane world as a scene with some buildings, and the other represented its uncertain nature as a wheel of Fortune. The choice of the wheel of Fortune for the center of the cosmograph has some basis. All Wheels of Fortune stem from Boethius, De Consolatione Philosophiae, even though he barely mentioned the wheel (his whole book is about Fortuna, but not about her wheel). What Boethius did talk about was two spheres, the sphere of Divine Justice, and sphere of Providence, or Destiny, or something like that (I can't decipher NeoPlatonism in any language), surrounding the sphere of the fixed stars from Ptolomy's astronomy. I can't tell you what these wheels are, exactly, but there are definitely two of them. The medieval cosmograph as a picture of the concentric eternal spheres, comes from Boethius. Our third cosmograph: Here is the first ever cosmograph, a marginal jotting in a copy of Boethius, dated before 1000. The dot is the Earth, and the four rings from the center are 1) some planet's orbit, 2) the firmament of fixed stars, shown darker because it is opaque, and 3&4) the two Heavenly spheres introduced by Boethius. That's what makes this a cosmograph. Our fourth cosmograph: Here is the first cosmograph ever, not counting that marginal jotting. The red dot is the Earth, surrounded by the same four spheres. We see "Providentia," a cross, and the letters around the outside spell out Fatum (Gautier couldn't read them; another gift from the great images now available from the BnF). The eight lines connecting the divine outer spheres with the firmament (second sphere) are something or other that goes back and forth between the spheres. Our fifth cosmograph: Here is a cosmograph by Hildegarde of Bingen; the sphere surrounding the Earth is now an enormous body. Our mundane word in the center, is here represented by one standing human, which is called (in the manuscripts) the microcosm. Hildegarde is not interested in the Zodiac, but she is in the cycle of the year. The 12 blowing heads in the above picture are not the Zodiac signs, but the four cardinal winds, each of whom has two assistants. Ecce per alterutrum, vadit conversio rerum ». Ante diem mortis, palet hec mutatio sortis ». Without getting too much into the NeoPlatonism, you could say that a picture of Fortuna's wheel only makes sense when it is in the middle of a cosmograph. In the view of Boethius, the origin of both, an evil man is driven by his lusts, but this does not bring him happiness, because his lusts change him from being a human, into an animal (the non-laughing kind), and it is not happiness for a human to be an animal. He becomes a pig, or a wolf, or a fox, or something else, depending on which sin or drives him.. To Boethius, in prison accused of treason, his consolation was that the satisfaction of his lusts that he could no longer pursue, now he was no longer a Senator, and the adulation of flatterers he could no longer enjoy, had not been happiness anyway. Fortuna delights in raising up the strivers, and bringing down the proud, but the proud one at the top does not have true happiness from being there, and the one crushed beneath has not lost it. But might it not be that, after all, Theodoric the king of of the Ostrogoths was happy, and ex-Senator Boethius the traitor in prison was unhappy? It is Providence and Divine Justice that keeps this from being the case: Providence may allow an evil man to deprive a good man of high place, but this is a gift, to keep the good man from becoming an animal, to keep him from the temptations of power. The same circumstance, brought about by Providence, also gives the evil man one last chance to save himself: he only does the evil thing if he chooses to do it. Providence and Divine Justice work in ordinary time, not only on Judgment Day. Destiny also comes into it, but don't ask me how. Providentia, Divine Justice, and Destiny are somehow related to the two outer spheres, at huge distance from the Earth, but all the same there is influence constantly passing back and forth. That whole, the chance-ruled terrestrial globe, surrounded by the planetary orbits, then the sphere of the fixed stars, and all of that surrounded by the two spheres of Providentia and Divine Justice, is the cosmograph. Fourth Wheel of Fortune, with a Wheel of Life. Here is a wheel of Fortune combined with a cycle of the ages of Man, a frequent combination. The outer circle of 16 images are 16 stages of life, with the ones on the right showing decay after passing life's peak, with the head downward. The original is a psalter in the FitzWilliam Museum, Cambridge, MS 330, but it is not online. The date is around 1250. Divine justice and mercy come into this image as well: In the inner circle of roundels the monk Theophilus goes down from goodness to making a sealed contract with Satan, going down on the right, but then he goes up on the left by repentance and a prayer to the Virgin, climbing up to salvation and sainthood. (His feast day is February 4, yesterday). So this is another combination, in three concentric circles, of 1) a circle of chance, 2) and a circle of life's passage from promising youth to decay, old age, and death, and 3) a circle related to Hell and Heaven, damnation and salvation. This psalter is not on line, but I've seen one other page from it, a Last Judgment (the page numbering is not clear, but both pages are at the very start of the book, so they are near to each other, and perhaps on facing pages). It seems to be the case that when a picture of our human world is not surrounded by a picture of the Last Judgment, that picture is never very far away. As we already noted, the examples of the mosaic floor and the rose window at the cathedrals of Turin and Lausanne respectively attest to the ubiquity of cosmological imagery beyond the relatively inaccessible form of the manuscript page. In fact, the images of the Wheel of Fortune and its variant, the Wheel of Life, were accessible and visible to all in church decoration, in painted, sculptural, and glazed parallels to manuscript images that were, by comparison, limited to the few. Most obviously, painted wheels occurred in churches as wheel windows and rose windows. Consider, for instance, the sculpted figueres surrounding the thirteenth-century rose window of the south transept of the Cathedral of Amiens where the advancing and declining Ages of Man surmounted by a regal figure symbolic of wealth and fortune are represented, a fitting comparison to the manuscript illumination just considered. In England, however, there was a particularly strong tradition of wallpaintings in churches and secular buildings that made available to a diverse viewing public the Wheel of Fortune and its transformation as the Wheel of Life. The floor mosaic Kline mentions is in Chiesa Gesù Salvatore, Torino, and supposedly it has a wheel of Fortune at the heart of an allegorical mappemundi, but I can find no usable pictures. There is a Wheel mosaic on a floor in Sienna, but it's not old; there was a Medieval wheel there but who knows what it really looked like. In addition to the rose windows at Amiens and Lausanne, we might also mention Basel : http://therosewindow.com/TheRoseWindow2 ... edral2.htm, St. Etienne de Beauvais, and the cathedral of San Vigilio, Trento (wiki). Verona's rose window will be mentioned in a bit. Not many of those those English church murals survive (Henry the VIII did them all in). On tarotwheel.net there's a claim that one dates to the 7th century in Rochester, but I doubt it. There may have been a church at that place since the 7th century, but not this one. The Wheel of Fortune. The thirteenth-century Wheel of Fortune is by far the best preserved of Rochester's mural decorations. One half of the work has survived as a result of being covered for several centuries by a pulpit. 'Fortune' was a popular theme among others during this period, as was the Wheel of the Five Senses, an example of which can still be seen at Longthorpe Manor. Wheels of the Seven Sins, of the Virtues, of Life and of Pride survive in other locations. The conflict between virtues and vices emanates from Prudentius' Psychomachia of the early fifth century: man must arm himself spiritually to defeat the forces of evil, and all living creatures are woven into the rotating wheel of fate. The mention of the Psychomachia in this connection is of course interesting because of the seven virtues in the Minchiate, but I have not yet found any consistent pattern. I do not have even one picture of a "wheel" of the seven virtues. Fifth Wheel of Fortune, the rose window at Amiens. Here is the first figure on the downfall half of the wheel. As he begins his descent, the first thing that happens is that his gown flips forward, exposing him naked below the waist. This is a concept also from Boethius: when Fortuna trips you up, at once all those who knelt to you and flattered you, will laugh at you in contempt. Sixth wheel of Fortune, and a second wheel of the ages of man: These are on facing pages of a manuscript dating about 1180. I'm told this manuscript was once in the Visconti library in Pavia. It's in Paris now. (I wonder how it got there.) Unlike the first wheel of ages we saw, this one has seven ages, the classical number. En ego fortuna moderor mortalibus una. Ellevo, depono, bona cunctis ac mala dono. According to Wikipedia "In 1905, graffiti designs for a large Last Judgment were discovered on the pediment. Central to the upper façade is a rose window, in the shape of a Wheel of Fortune, ... The outer rim of the window is decorated by six figures representing the vacillations of human life." But I'm not clear on where the Last Judgment is, relative to the Wheel window. Dat fortuna bonum. Sed non est durabile donum. Attollens pronum. Faciens de rege colonum. Dat fortuna bonum. Sed non durabile donum. Extollens pronum. Facit et de rege colonum. This is correct to the C.B. manuscript with no changes except the expansion of the usual Latin abbreviations. Dat fortuna bonum. Sed non durabile donum. Attollit pronum. Faciens de rege colonum. I don't know where this version of the C.B. text comes from, with “Faciens de rege” rather than “Facit et de rege” and “Attolit” rather than “Extollens.“ . But wherever it comes from, this alternate version of the Carmina, brings it is closer to the Richardus text, which has "Facit et" and (not "Attollit," but) "Attollens." Ludus fortunae variatur imagine lunae; crescit et decrescit, in eodem sistere nescit. Reading the wheels, passage 4. In front of the rising figure is: rurfus ad alta vehor [another passenger for the peak]. Under the king is: Glorior elatus [elated with glory]. In front of the downfalling figure is: descendo minorificatus [down into reduced condition]. Above the crawling man at the bottom: Infirmis axe premor [broken, crushed under the axle]. glorior elatus ; descendo minorificatus ; Infimus axe premor ; rursus ad alta vehor. Reading the wheels, passage 5, on the second wheel, the wheel of 7 ages. 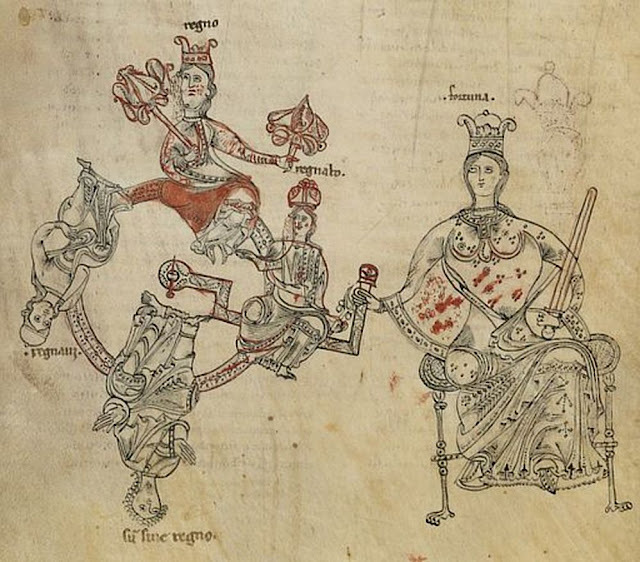 The six ages around the wheel are labeled: Infantia [birth-7], Pueritia [7-14], Adolescentia [15-21], Juventus [21-49], Senectus [old age], Decrepita [creaking]. When this list is given, there is usually Gravitas between Juventus and Senectus, but not here; and Decrepita is just nasty. The seventh age, mors, [death] is in the hub. Reading the wheels, passage 7. Around the center is: Pulvis caro cinis ver erus miser unde superbis. [ Proud man, you spring from wretched dust and ashes -- maybe ] I did not find this as a quote anywhere, but Ne, pulvis et cinis, superbe te geras, Omnipotentis ne fulmlna feras. is a quote that means, Dust and ashes, be not elated with pride, lest the lightnings of the Omnipotent should reach thee. Another quote is: quid superbia terra et cinis. So what's the score? I did say this post would be brief, and already it is not. Well, what's the score? How well does the Minchiate deck, laid out in rows, with the highest trumps up high, match up with a cosmograph? From the top: 1) Highest should be a Last Judgment, and a figure who presides over the world? Check. 2) Then the firmament, usually represented by the Zodiac? Check. 3) Planets? Well, only two, and technically they should be below the Zodiac rather than above it. Still, a cosmograph almost always has a Sun and Moon. Semi-check. 4) Under the sky is the Earth. The four elements are classic, often hinted when not explicit. The Minchiate has them just where they should be. Check 5) The virtues. Oops. I've yet to see the seven virtues in a cosmograph. No check. 6) A cosmograph with a Wheel of Fortune, needs figures for the Wheel : there should be young strivers, a throned emperor in middle age, a disgraced man upside down, a man in creaking old age, and a dead man. Perhaps the Minchiate has these? They'd be around the Wheel of Fortune, and below the sky, which in a cosmograph is the Zodiac. ... sorry, out of time. Sixth wheel of Fortune, and a second wheel of the ages of man: These are on facing pages of a manuscript dating about 1180. I'm told this manuscript was once in the Visconti library in Pavia. It's in Paris now. (I wonder how it got there). It would have gotten there via Louis XII's plundering of the Visconti Library after 1500. I assume your source is the "detailed information" icon at the BNF link. If I am reading it right, it has the library at Blois as also owning it. That castle was Louis XII's pride and joy, and he made many renovations. The cosmograph further down in your post, the one with monks climbing, was also at the Visconti Libary, at least according to Ross somewhere on this forum. That's the earliest one I've found. The words around the circle are the same as on the early tarot cards, of course. The Wheel of Fortune was well known in classical times. Herodotus, writing in the 5th century b.c.e, said, “Men's fortunes are on a wheel, which in its turning suffers not the same man to prosper for ever” (A. D. Godley, translator (1931), Histories vol. 1, book 1, section 207, p. 261). In the same vein Ammianus Marcellinus (Historia, XXVI. 8) said, “Anyone who is prosperous may by the turn of fortune's wheel become most wretched before evening.” The philosopher and playwright Seneca expressed the same sentiment in numerous ways, as did many others. Also, Nemesis was sculpted with her own wheel - albeit not with men clutching it - for her use on behalf of the gods to bring down those whose pride went so far as to challenge them. Wikipedia makes the interesting suggestion that the zodiac itself was the source of the wheel idea, since it forms a circle around the earth. The cosmograph further down in your post, the one with monks climbing, was also at the Visconti Libary, at least according to Ross somewhere on this forum. Here is the information, Mike. From Sandy's illustrations, it is nice to see that Gallica now has much higher-resolution images than 5 or so years ago. We live in a golden age of information! If only scholars would also choose to self-publish, and market by social media, we could have a real revolution in the humanities.